Info: 2 BR, 1 BA Vacation Rental, slps 5. San Diego condo, beach resort home in Southern California. This 2 bedroom, 1 bath property is furnished with relaxation and simplicity in mind. Quality and comfort are yours in every room. The large, private deck has patio furniture, a gas grill, and of course, the unforgettable view! The master bedroom has a queen bed and the 2nd bedroom has a bunk bed with a twin top and a full-size bottom. Parking is available on site in a private, one-car garage. Mission Beach is one of San Diego’s most popular beach destinations. It is here where you can enjoy what everyone comes to the beach to enjoy. Whatever it is you want to enjoy on your vacation, you will find it just steps away from this oceanfront property.*. 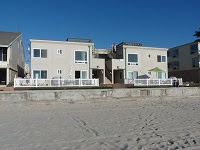 SoCal Beach Vacation Condo Rental in San DiegoCA..